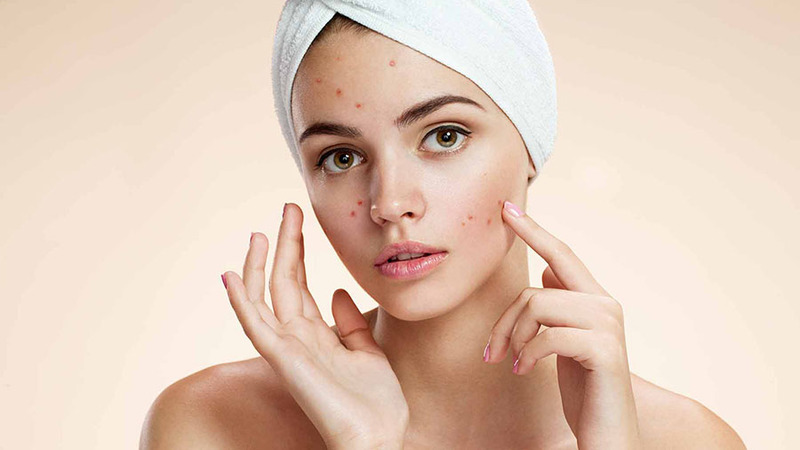 Acne vulgaris is a widespread skin problem. Whether on the face, neck, chest or back – acne can affect people of all ages. Their typical features are white pimple-filled pimples and lumps, blackheads and red small bumps on the skin. Acne is often the result of acidification of the body, hormonal changes, certain medications, poor hygiene and excessive skin irritation. If acne is not treated correctly and on time, acne scars and dark spots on the skin may form. Acne should be treated primarily causally. With the help of numerous home remedies, this process can be supported naturally. Aloe Vera helps very well with mild to moderate acne. Aloe Vera contains the anti-inflammatory and antibacterial compound saponin, which helps to kill acne bacteria, prevent infections and additionally supports the healing of damaged skin. For the use of aloe vera: Cut off one aloe vera leaf, take out the containing gel and apply to the affected area. Repeat this application once a week for 1 week. The spice turmeric contains the antioxidant curcumin. Curcumin has anti-inflammatory and strong antimicrobial properties that target acne bacteria. Regular use of turmeric helps to reduce acne bacteria. For the application of turmeric, apply 1 teaspoon of turmeric powder with enough water or rose water to a paste, spread on the affected skin and leave to dry on the surface. Rinse the dried paste with cold water. Repeat once a day, twice a week, to counteract blemishes. Extra virgin coconut oil is perfect for sensitive skin. With the help of antioxidant antibacterial and antifungal properties, coconut oil removes harmful microbes from the skin and provides sufficient moisture. Also, coconut oil acts as a natural and high-quality anti-ageing agent and reduces wrinkles. For the application of coconut oil, wash the skin thoroughly before going to bed and pat dry with a soft cloth. Massage the affected areas with a small amount of extra virgin coconut oil. The next morning washes the oil off. To increase the effect of coconut oil, consume 1 tablespoon of coconut oil 2 times a day. The coconut oil can either be sucked and swallowed or added to smoothies and salads. Baking soda or sodium bicarbonate with its anti-inflammatory and antiseptic properties works well against rashes and acne. At the same time, it helps to balance the pH of the skin and to cleanse the skin. Just mix 1 teaspoon of baking powder with some water to form a paste. Apply the finished paste with a cotton swab to the affected areas, let it react for one minute and then rinse off. Repeat 1 to 2 times a week. Apple cider vinegar has antibacterial and antiseptic qualities that cleanse the skin pores of bacteria and excess oil. Also, apple cider vinegar helps to restore the pH of the skin and can be used as a natural tonic. For the use of apple cider vinegar: Mix 1 teaspoon of unpasteurized and naturally cloudy organic apple cider vinegar with 3 teaspoons of filtered water. Dip a clean cotton ball in it and apply the solution to the affected areas. Let it soak in for 10 minutes and then rinse with warm water. Repeat once a day for several days. To aid the cleansing process, add 1 teaspoon of cider vinegar to a glass of warm water and use 1 or 2 times a day. Cucumbers have an astringent (astringent) effect that helps to reduce inflammation, accelerate healing processes and normalise the pH of the skin. In addition, cucumbers have a cooling and soothing effect. This helps to reduce the pain of acne.